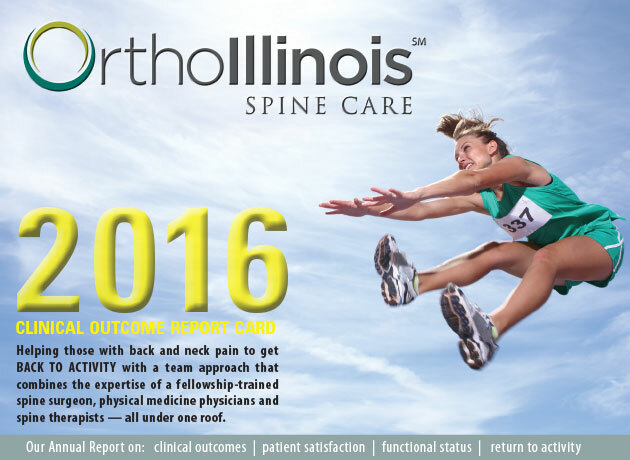 Recognizing that back and neck pain requires a spine center of excellence approach, OrthoIllinois in 2012 founded the OrthoIllinois Spine Care. The Spine Center combines the expertise of a fellowship-trained orthopedic spine surgeon, two physical medicine doctors who specialize in non-surgical treatment options, MRI, X-ray, and an internal physical therapy gym with spine therapists — all under one roof. 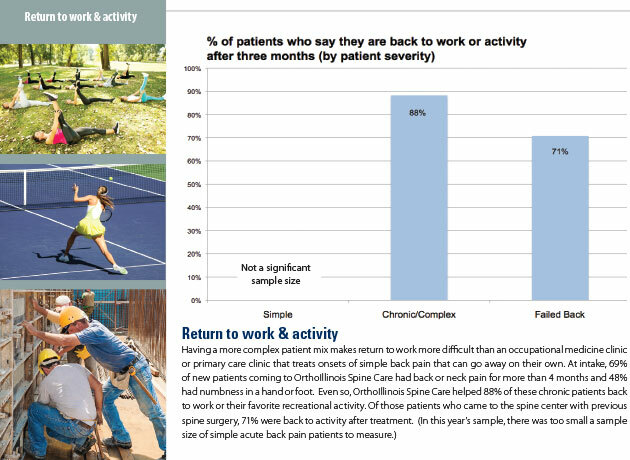 By emphasizing non-surgical treatment options like therapy and spinal injections, 90 percent of our spine patients are able to get back to activity without surgery. 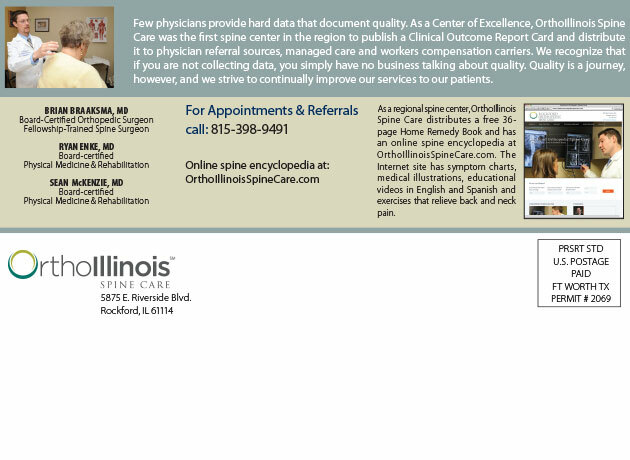 This comprehensive spine care program saves those in northern Illinois from having to drive to Chicago for the best spine care. The spine center at OrthoIllinois combines the expertise of orthopedic spine surgeons, board-certified physical medicine & rehabilitation specialists and spine therapists all under one roof. 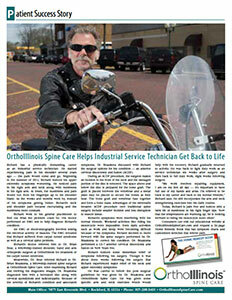 The spine team sees patients in offices in Rockford and Algonquin, Illinois. The physical medicine & rehabilitation MDs specialize in interventional pain management, electrodiagnostic testing, non-surgical spine care, and spinal injections. Also, the spine center offers a team of spine-specialized physical therapists with an on-site gym. The goal of OrthoIllinois Spine Care is to improve the care of back and neck pain for those in northern Illinois who would otherwise have to deal with the inconvenience of travelling to Chicago. ecause the spine center facility has X-ray, MRI, injection suite, and spine PT gym, all under one roof, the patient no longer has to drive to multiple locations for comprehensive care of their back and neck problem. 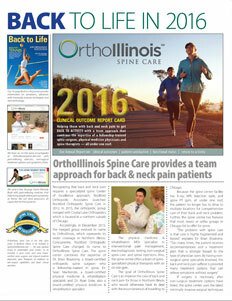 Further, the spine center has features that most neuro or ortho groups in Chicago fail to offer for spine. 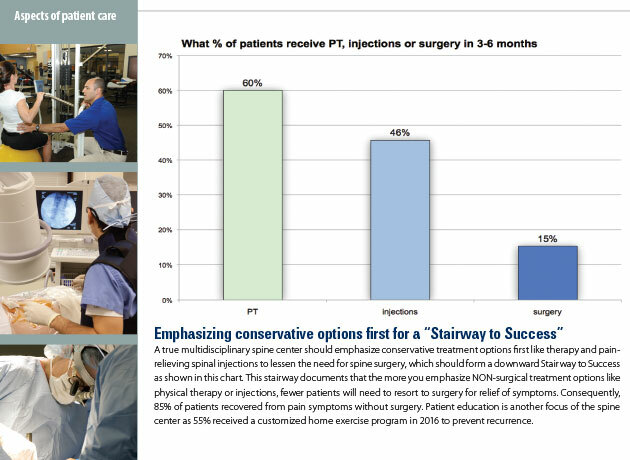 A true multidisciplinary spine center should emphasize conservative treatment options first like therapy and pain-relieving spinal injections to lessen the need for spine surgery, which should form a downward Stairway to Success as shown in the following chart. This stairway documents that the more you emphasize NON-surgical treatment options, fewer patients will need to resort to surgery for relief of symptoms. 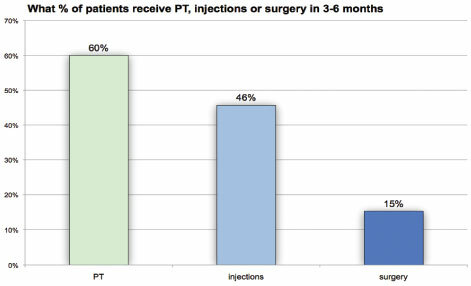 Consequently, 83% of patients recovered from pain symptoms without surgery. 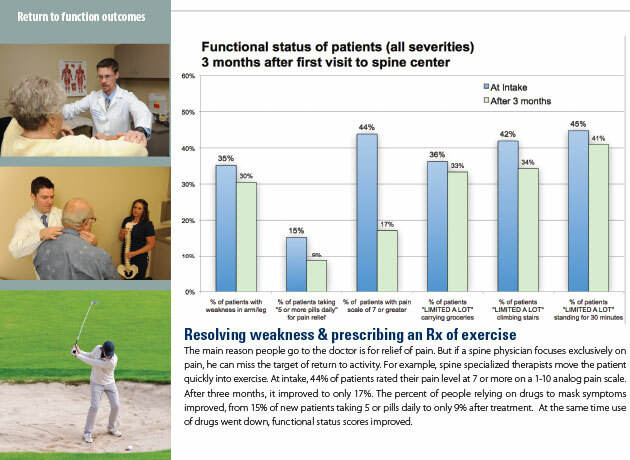 Patient education is another focus of the spine center as 35% received an educational Home Remedy Book, and 54% received a customized home exercise program to prevent recurrence. As a free community service, this Spine Center of Excellence mails out Home Remedy Books on a limited basis to residents in the region. Home remedy books include information about the spine center, instruction on how to use the exercise book, various exercises to help alleviate back and neck pain, and other home remedies. For those back and neck pain sufferers who have exhausted nonsurgical treatment options, spine surgery may be the next step in resolving a spine problem. Because spine surgery is a serious decision, it is a good idea to obtain a second opinion from a board-certified and fellowship-trained spine surgeon before undergoing surgery. 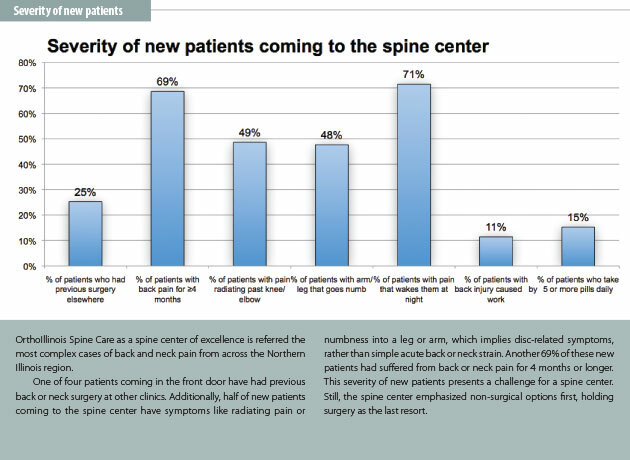 The centers featured on Spine Center Network are the ONLY spine centers in the United States that collect and report clinical outcomes and patient satisfaction scores to external physician referral sources, employers, insurance company payors, case managers and consumers. 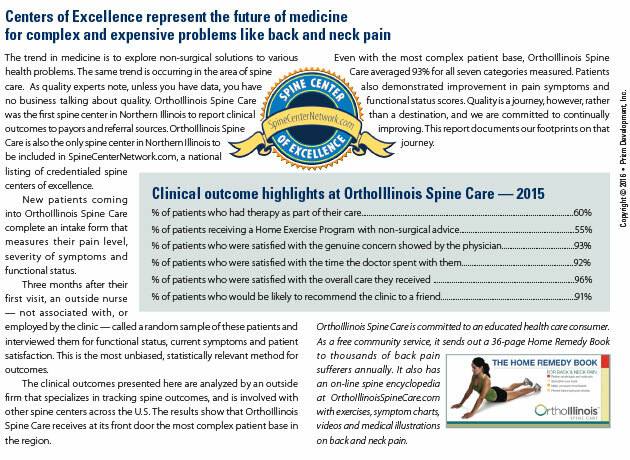 Dating back to 1995, Prizm spine centers were the FIRST spine programs in the nation to produce and DISTRIBUTE Clinical Outcome Report Cards to external audiences. However, that is changing rapidly. 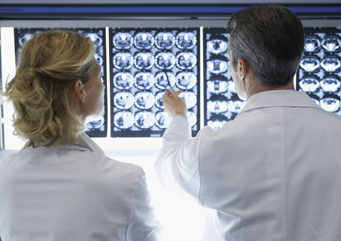 With the proliferation of spine centers in the United States, and physicians and hospitals chasing after the lucrative spine patient, the race is on to publish outcomes for strategic advantage. Prizm awards a Crystal Apple, entitled the Marcus Welby Award, for the doc who scores the highest for the three categories: time spent with the patient, medical explanation and genuine concern. All spine center development content is intellectual property of Prizm Development, Inc.